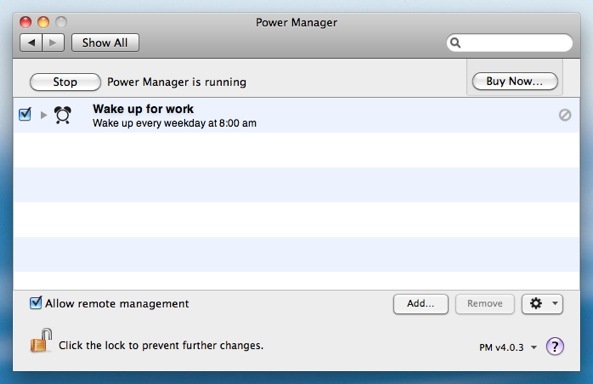 Modern Macs are able to wake up from sleep, and start up from a powered off state. One quick and easy use for this ability is to avoid waiting for your Mac to start up in the morning. 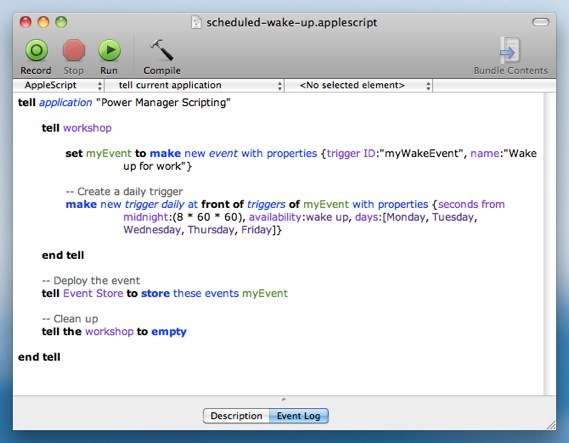 We are going to create an event using Power Manager and AppleScript. You can also create this event using just Power Manager's System Preference; a previous recipe shows you how to schedule your Mac to power on without AppleScript. When you run the above AppleScript, a new event is created in your schedule. You can run the AppleScript as many times as you like; each time the event is created, the previous event is overwritten. This is because the new event and any previous event share the same identifier. The above AppleScript contains three pieces of key information. These pieces are the trigger daily's properties. The properties are the seconds from midnight to wake your Mac, the availability, and the days of the week to schedule the trigger. You can alter these properties and change the behaviour of the event to better suit your needs. trigger daily n [inh. trigger] : Trigger at a given time on given days of the week. Contained by events, local workshops. (integer) : Seconds past midnight to trigger. The trigger's time is measured in seconds from midnight. Where 0 seconds equals midnight. (list of Saturday/Sunday/Monday/Tuesday/Wednesday/Thursday/Friday) : Days of the week to trigger. (wake up/power on/power on or wake up) : Should the host be made available for this trigger. (integer) : Scatter the date. (boolean) : Minimise the notifications. 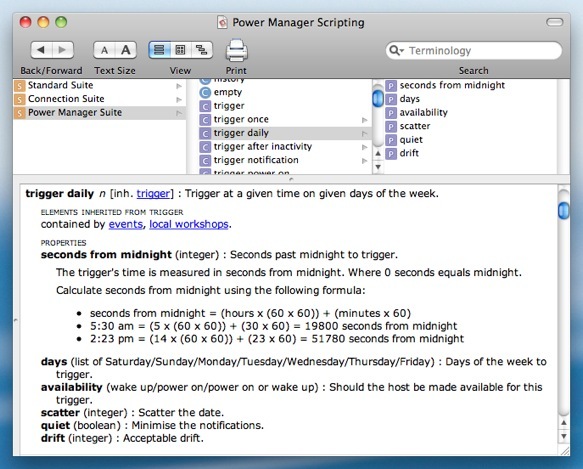 Take a look at the Power Manager AppleScript dictionary and our AppleScript Guide to get a feel for what else you can achieve with Power Manager on Mac OS X. This article was posted in AppleScript, PM4, Power Manager, and Recipe and tagged AppleScript, Power Manager, and recipe.